What happens if you see a giant alien octopus that pilots a giant UFO? Oh wait, you are the giant alien octopus. UFO Holic is an iPhone app where as the octopus, you are trying to capture humanoid beings called mogs in order to combine them all into a female octopus. You capture mogs by using smaller UFOs that look stereotypical alien heads. They latch onto a mog’s head and drag them back to the mothership. The basic gameplay in UFO Holic is to tap a mog and draw a path to the mothership’s gates that matches the color of the mog. This kind of gameplay is used during day levels. Night levels require you to tap a location near a mog to create a shock wave that will send them in to a worm hole with the same color. In these levels, mogs have a chance to explode and can be quite frustrating. You can get coins by using real life money to buy them or by doing combos and touching the coins to collect them. Combos are done by directing a mog to the same location a same colored mog went. When the combo gauge is full you can activate a time warp by shaking. Time warp will allow you to direct mogs without them getting hit if there are too many of them. A mog can be of one of four colors and they can have different things such as the yellow one being heavy while the green one is light. When a mog gets hit or explodes it will deplete a heart when all hearts are depleted and a final hit takes place, you will lose. Coins are used to upgrade an ability. There are ten abilities and are all pretty useful. They can make more gates and worm holes open up or lowering the time it takes for a mog to explode. These abilities are expensive to level up. UFO Holic increases its difficulty very quickly. If you get adjusted to a game mechanic, it will suddenly throw a new thing at you and sometimes it will do this on the very next level. This app includes an achievements feature but I have not tried it out yet. The game will quit sometimes so innoace have to do some updates. UFO Holic is a fun app despite the difficulty and crashes. The graphics are sharp, colorful, and polished. UFO Holic looks like something from an eastern animation. The mogs and the octopus are cute. The mogs are adorable especially the one that appears when rush hour and armageddon. The details of a stage are impressive. From sphinxes and moai statues, the images are amazing. The background visuals are repetitive throughout a continent. UFO Holic’s graphics are impressive and detailed but are repetitive. The audio is very good. The music is upbeat and fits the atmosphere of the game very well. The sound effects are nice as well. From the mog exploding which sounds like a splat and using a shock wave is a pop, these effects adds more emphasis to UFO Holic. 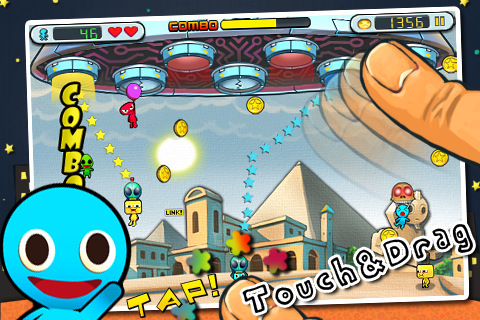 UFO Holic sells for $0.99 in the App Store. This is a fair price for a puzzle game like this. This game is difficult but something about it will make you come back for more. Maybe it’s the graphics, gameplay, or the story. UFO Holic requires patience and persistence to play since it will throw new mechanics at you when you least expect it. The replay value is beating the stages to get bronze, silver, or gold medals. There is also an achievements feature but does not display what you did to get them offline. Also, upgrading your abilities will take a nice chunk of time or you can buy the coins with real life money. UFO Holic is a fun yet difficult puzzle game despite a few things like how many coins it takes to upgrade your abilities and the random crashing, this is a great game. I hope innoace will update and address all of these problems. 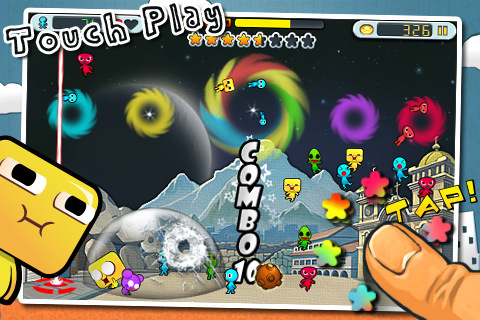 AppSafari review of UFO Holic was written by Tony Lau on February 26th, 2011 and categorized under App Store, Games, Puzzler. Page viewed 3392 times, 2 so far today. Need help on using these apps? Please read the Help Page.